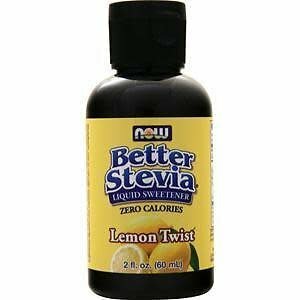 A zero-calorie, low glycemic, natural sweetener that makes a perfectly healthy substitute for table sugar and artificial sweeteners. Nutrition Facts: Servings: About 492, Serving size: 5 drops (0.12mL), Amount per serving: Calories 0, Total Fat 0g, Sodium 0g, Total Carbohydrates 0g, Total Sugars 0g, Protein 0g. Not a significant source of saturated fat, trans fat, cholesterol, dietary fiber, vitamin D, calcium, iron, and potassium. Ingredients: Vegetable glycerin, certified organic stevia leaf extract, natural lemon extract (in an alcohol base), natural lemon oil. Contains 12% alcohol. Keep out of reach of children. Not manufactured with wheat, gluten, soy, milk, egg, fish or shellfish ingredients. Produced in a GMP facility that processes other ingredients containing these allergens.